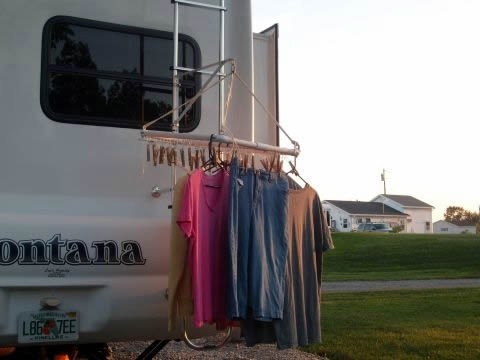 One thing RVers miss from home is a laundry line. Even if you don’t have a washer/dryer in your rig, occasionally you may need to wash out something in the sink, dry pool towels, etc. 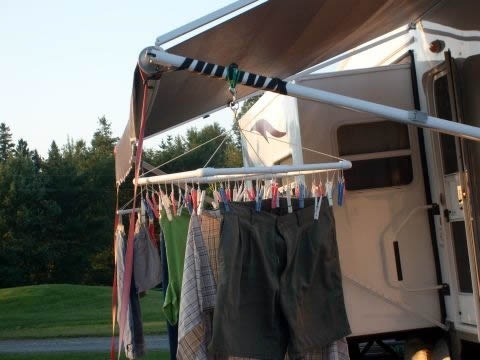 It’s nice to have a laundry line then but most campgrounds prohibit stringing one between trees. A few very snooty campgrounds forbid ALL outside laundry so be sure to check the rules. 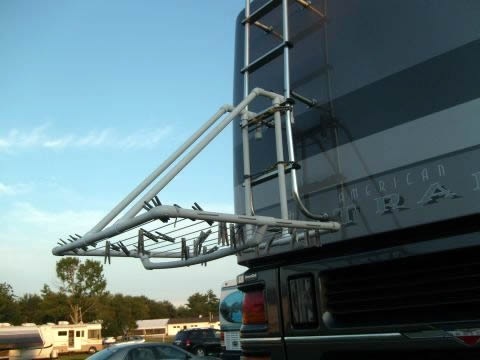 What to do then for the many campgrounds that allow racks? Camping World sells one that folds in and out and mounts on the RV or RV ladder. They also sell a bumper mount one and one that free stands outside or in the shower. Those are all good options. If you have a hankering to make one for yourself, here are some specific plans I found on how to make a PVC ladder rack. Click here.